In order to comply with the General Data Protection Regulations (GDPR) which comes into force 25 May 2018, we are required to inform you as to what data we collect and how it is processed and handled once we receive it. This data is submitted by you as part of your membership profile and as such you can log into your account and amend or remove this information whenever you wish to do so. This data is periodically backed up onto remote servers and 3rd party secure storage, all by our web hosting provider. Your information will only be used for legitimate purposes, such as the Welsh Snooker tournament calendar or the newsletter. Note that the newsletter does include a link to opt out of receiving future newsletters. 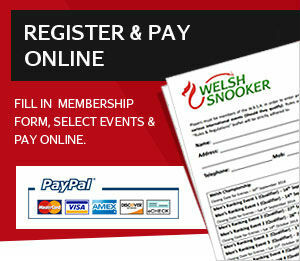 We will not transmit your information to other parties unless it is required for your own entry into a competition not organised by Welsh Snooker, for example the EBSA, HIBSF, IBSF, WSF or World Snooker. All data disclosures will only be relevant to the particular requirements of the competition in question. This information will be handled in accordance with the guidelines of the GDPR and again will only be relevant to the requirements of your competition entry. Occasionally we may elect to stream matches over Facebook Live or on YouTube. When we use these services, the GDPR policy of Facebook or YouTube will apply in full. Should network signal be poor, the video may be recorded locally for upload to YouTube later. No recordings will be stored for longer than 28 days. We will hold the digital files on record as required to operate the Welsh Snooker tournament calendar and associated ranking tables. These are stored on secure servers by our web hosting company.